SAN FRANCISCO -- More than 70 passengers aboard an Asiana Airlines flight that crashed in San Francisco two years ago have reached a settlement in their lawsuits against the airline, attorneys for the passengers and airline said in a court filing Tuesday. The settlement with 72 passengers who filed personal injury claims also includes Boeing Co., which made the airplane, and Air Cruisers Co., the New Jersey company that made its evacuation slides. The filing did not include the settlement's financial terms, and plaintiffs' attorney Frank Pitre said those details are confidential. This is the first set of lawsuits stemming from the crash to be resolved, he said. Dozens of additional cases involving more than 70 plaintiffs are still pending in federal court in Northern California. "This is the first positive step for these passengers to be able to get closure on a tragic, catastrophic crash and hopefully try to get their lives back together," Pitre said. "We're pleased we've been able to get this first phase resolved." Boeing spokesman Miles Kotay said the aircraft maker does not comment on pending litigation. Calls to attorneys for Asiana and Air Cruisers Co. were not immediately returned. 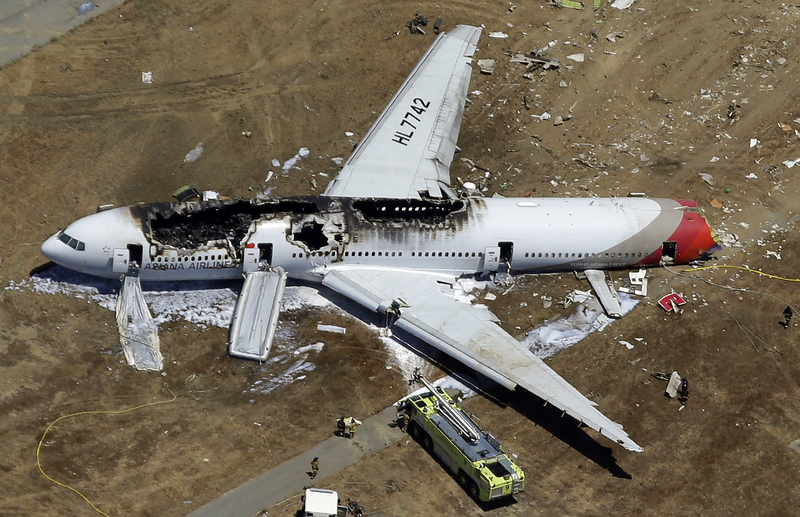 The July 6, 2013, crash of Asiana Flight 214 killed three Chinese teens and left nearly 200 people injured. The Boeing 777 traveling from South Korea slammed into a seawall at the end of a runway during final approach to San Francisco International Airport. U.S. safety investigators blamed the pilots, saying they bungled the landing approach by inadvertently deactivating the plane's key control for airspeed, among other errors. But the National Transportation Safety Board also said the complexity of the Boeing 777's auto-throttle and auto flight director -- two of the plane's key systems for controlling flight -- contributed to the accident. The NTSB also faulted materials provided to airlines by Chicago-based Boeing, saying they fail to make clear the conditions in which the auto-throttle doesn't automatically maintain speed. Pitre said the passengers who settled had injuries that were less serious and have stabilized. At least 14 of the people with whom settlements were reached are minors, requiring the court to approve the agreements, according to Tuesday's filing.